Thank you Dr. Chen. Thank you Consul General Galt, Deputy Secretary-General Gao. Good morning. We are honored to be with you here today. This is my 7th visit to China, and my 2nd visit to the miracle city of Shenzhen. It was just a little over a year ago that we came to Shenzhen to celebrate the initiation of Georgia Tech’s membership in the Shenzhen Virtual University Park, the first institution from the United States to do so. We are fortunate that in August of last year we received approval from the Chinese Ministry of Education to offer the Georgia Tech Master of Science Degree in Electrical and Computer Engineering in Shenzhen. We appreciate the multiple visits that the Shenzhen Municipal Education Bureau and our program sponsor, Tianjin University, have paid to the Chinese Ministry of Education on Georgia Tech’s behalf, and it is with their championship, along with our strong credentials in implementing international education programs, that our program application has sailed through the rigorous approval process of the Ministry of Education. We also thank the Shenzhen Science, Technology and Innovation Commission and the Shenzhen Municipal Foreign Affairs Office for their support. We are proud to be the first American university to have an approved academic program in Shenzhen. 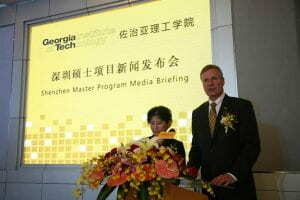 The Georgia Tech Master’s degree program in Electrical and Computer Engineering will also be the first full-time academic degree program taught from the Shenzhen Virtual University Park. The opening day of our graduate program will be on August 18, and I am told that the number 8 brings good luck in China. Georgia Tech has always been a trailblazer in international education and I am pleased that we will be leading the way of international education in Shenzhen. We choose Shenzhen because it is a high tech and innovative city, and Georgia Tech offers outstanding technologically-oriented education. There is an excellent match between what Shenzhen values and what Georgia Tech has to offer. 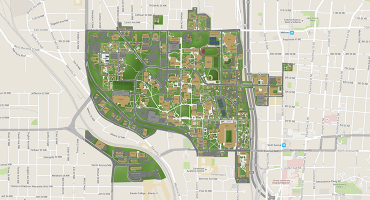 Georgia Tech is located in Atlanta, Georgia, home to CNN, Coca-Cola, Delta Air Lines, and the Centennial Olympic Games. In 2012, Atlanta Mayor Kasim Reed visited Shenzhen and our two cities entered into a Memorandum of Understanding to promote exchanges in fields of education, culture, business, trade, science, technology, and tourism. Georgia Tech is proud to have taken concrete steps towards the fulfillment of those goals and objectives between Atlanta and Shenzhen. Georgia Tech has the largest College of Engineering among all US universities and graduates the largest number of engineering students in the US. In a recent article by The Wall Street Journal, Georgia Tech was rated the #1 school in terms of engineering, by top US companies looking to hire new employees. Offering practical education and conducting industry-relevant research is a core competency at Georgia Tech. I would like to express my sincere appreciation to the industry representatives that are here today from Eaton, Cypress Semiconductor Corporation, DTS, ZTE, Guangdong Solid State Lighting Industry Innovation Center, and the China Construction Bank. We look forward to partnering with you on education and training initiatives, student internships, research collaborations, and potential technology transfer activities. We are thankful to Tianjin University who has been our close partner and ardent supporter in the past five years. Since 2009, we have collaborated with Tianjin University on two annual undergraduate summer programs and this new graduate program in Shenzhen is the result of natural growth in our collaborations. In the Shenzhen graduate program, Georgia Tech will be responsible for admission, courses, instruction and degree granting, while Tianjin University will be providing administrative and logistical support. Diversity is highly valued at Georgia Tech. We aim to attract outstanding students from China, and other countries of the world, in addition to those from the United States. Eventually, we hope to see a balanced mix of Chinese and non-Chinese students in this program. Already, top notch American students are enrolling in Georgia Tech in order to come to Shenzhen for this program. As the Chinese people say, “Women are half the sky”. At Georgia Tech, we strongly promote women in engineering, graduate more women engineers than any other U.S. university. I am pleased to know that there is no lack of female students in China who excel in Science, Technology, Engineering and Mathematics fields, and we call upon these talented young ladies to consider becoming women engineers at Georgia Tech – Shenzhen. About four years ago the faculty, staff, students of Georgia Tech, along with alumni and community leaders joined together to create a 25-year strategic plan, called “Designing the Future.” One of the five principal goals of the plan is to “Expand Our Global footprint and Influence to Ensure That We Are Graduating Good Global Citizens.” At Georgia Tech, we also view ourselves as an economic driver for Atlanta, the state of Georgia, and the nation. We are pleased to have become a member of the American Chamber of Commerce in South China and we appreciate President Harley Seyedin and his staff from the Chamber for joining us at this event. 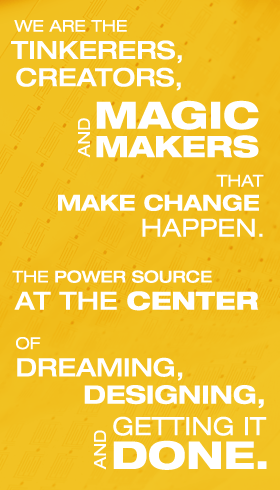 “A journey of a thousand miles begins with a single step.” We are here today to announce the offering of our graduate program in Electrical and Computer Engineering, the largest discipline at Georgia Tech. We expect that our presence in Shenzhen will grow significantly in the coming years that will lead to successes in degree programs, professional education, research, and entrepreneurial activities. Next, I would like to call upon Yves Berthelot, Vice Provost for International Initiatives, and Tong Zhou, Director for Georgia Tech – Shenzhen, to discuss in detail, our new Georgia Tech – Shenzhen program.